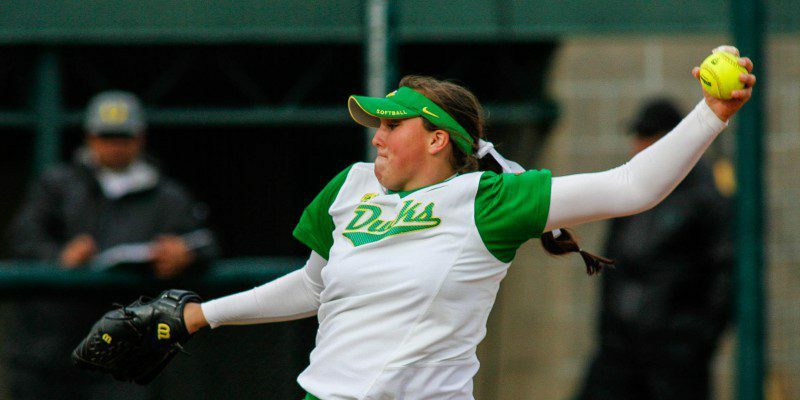 The Oregon Duck softball team proved why they’re ranked as the No. 2 team in the nation by trouncing both opponents in their opening doubleheader of the Kajikawa Classic in Tempe Friday. In the first game, Oregon crushed the Cal Poly Mustangs 8-0. Freshman Jenna Lilly collected two RBI’s in her first plate appearance as a Duck, smashing a double up the middle and scoring Alyssa Gillespie and Hailey Miller. Janie Takeda added another double in the fourth inning, enabling Dancia Mercado to score on a Mustang throwing error. Senior pitcher Karissa Hovinga tossed a four-hitter in the winning effort. Geri Ann Glasko notched the save and allowed only one hit in the final inning. Coach Mike White said of the game, “I thought it was a solid start. It was great to see Jenna, our freshman, get the first RBI of the season for us. Karissa did a great job of keeping their team off balance with her off-speed pitches. Then when Geri came in, she did a great job as well in her first appearance as a Duck.” A total of six Ducks made their first appearance in Duck uniforms in this season opener. The Ducks were even more impressive in the nightcap, shellacking the No. 25 Texas Longhorns. 9-0. Takeda started the game with a solo home run and the Ducks never looked back, blasting the Texas pitchers for 13 hits. Duck ace, Cheridan Hawkins, Pac-12 pitcher of the year, shut out the Longhorns with a two-hitter. Texas only threatened once, loading the bases in the fourth, but Hawkins pitched out of the jam with a strikeout to end the inning. She earned her 16th career shutout in this game. The Ducks had 25 hits in the two games of the double-header, led by Takeda who went 4 for 8 with a double and a home run. Duck pitchers held their opponents to only seven hits and no runs. The Classic continues today with the Ducks playing Northwestern at 3:45 p.m. (PST).